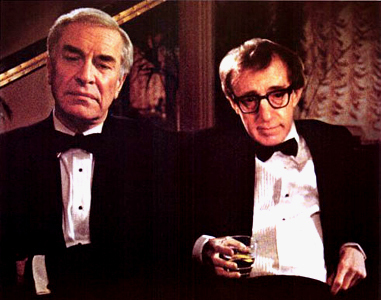 Woody Allen’s films can be hit or miss. Some I adore, while others I find it a struggle to sit through. After writing, producing, directing and/or acting in so many films for such an extended period of time they can’t all be great. One of his standouts on his film resume for me is 1989s Crimes and Misdemeanors. Allen plays a struggling documentary filmmaker who is attempting to complete a film about a philosophy professor. Needing money to finance this endeavor he lowers himself to film a cushy profile documentary about a narcissistic, successful sitcom creator who happens to be his brother-in-law (Alan Alda). While working on this project he falls for the producer (Mia Farrow), but as luck would have it so does Alda. The other parallel story concerns successful ophthalmologist Judah Rosenthan (Martin Landau), who has been having an affair with a woman (Anjelica Huston) who now is putting real pressure on him to leave his wife for her. She begins threatening of confronting his wife, is willing to reveal some of his past creative financial maneuvers and her constant phone calls backs Judah into a corner. He can’t reason with her and now faces losing everything in his life by this woman. How can he possibly get out from this? Although the film tells two stories and all the actors are very good, (the idea of casting Jerry Orbach as Landau’s brother is inspired) it’s Landau who shines the most. His performance of a man constantly under stress, trying to hold it together, but realizing the hole he now is in is terrific. Just the way he sits staring blankly in scenes, you really feel there is a storm of conflicts going through his head that he is just trying to process. The film raises questions of morality, ethics, religious beliefs, values, along with the required unique Allen dialogue and humor. It’s a very rich film and it’s one I enjoy revisiting. Martin Landau is playing Woody Allen’s first real villain and Alan Alda’s performance is the second great one in the movie too as he creates Allen’s second true villain also. The Oscars Will Be Murphy-Less!